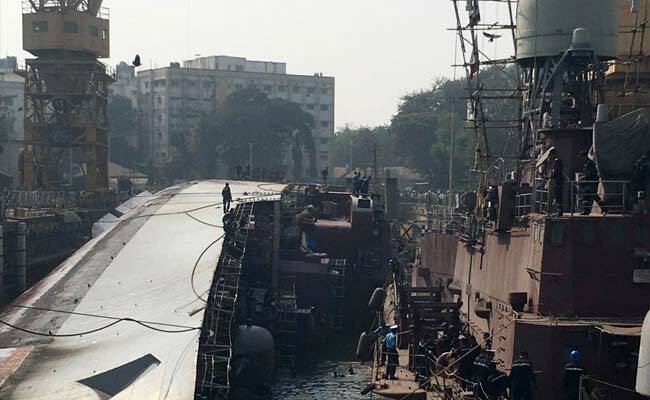 India's prized warship INS Betwa, a guided missile frigate, tipped over and crashed to its side at the on Monday, in what the navy described as an "unprecedented and sad" incident. Two sailors have died while 14 others have been rescued with minor injuries. The 3,850-ton ship is lying on its side at the naval dockyard. It was docked for underwater repairs. Around 2 pm LT, while the ship was being returned to the water - a process that involves tipping it - the system snagged and the entire ship fell sideways. The main mast of the ship broke. "This is a very big situation for the navy as this has never happened before... The incident occurred during undocking ...it is suspected that dock blocks mechanism failed," said navy spokesperson Captain DK Sharma. It is not clear yet how the massive 126 m long vessel, commissioned into the navy in 2004, will be set right again. The INS Betwa, one of the key warships of the Western Naval Command, is armed with Uran anti-ship missiles, Barak 1 surface-to-air missiles and torpedoes. It is the third Indian warship involved in a major accident while docked since 2011.